One of the easiest foundations to build for a shed is a gravel foundation, especially if you know how to build a gravel shed foundation. It’s not a matter of just dumping gravel on the ground if you want a lasting stable solid base to protect your shed. A well-made gravel foundation can support your shed directly or other foundation styles for your shed. To build a solid stable gravel foundation remove the grass and topsoil and level the ground. Compact the loose soil and cover with a weed barrier. Cover the barrier with gravel and spread it out evenly with a shovel and metal garden rake. Use a gasoline-powered compactor to tamp down the gravel. Do the final grading with a rake, and your foundation is ready for your shed. In this article, I’ll show you how to level and square up your site and what type of gravel or crushed stone makes a stable base. I’ll discuss how to build a boxed and unboxed gravel pad, and how to anchor your shed on a gravel foundation. Hopefully, I’ll save you a few steps, a bucket of sweat, some money, and you’ll learn how to build a gravel shed foundation. What is Gravel Shed Foundation? What does it Cost to Install Gravel Pad? A gravel shed foundation, or pad is a non-permanent stable structure on which to place or build a shed. It supports your shed on a solid ground level or near ground level pad similar to a concrete pad. Unlike concrete though, it can be easily removed. It provides a permeable well drained compacted level base and keeps your shed off the ground, and is less expensive than concrete. The size of the shed determines the size of the gravel pad, which also determines to cost of materials. The gravel pad should extend a foot or two beyond the sides of your shed too. Gravel pads are best for flat or near flat locations, but retaining walls can help level almost any location. Check with your local building department to make sure your project meets local requirements. Also, give your local utilities a call too before you put a shovel in the ground and through your phone or cable line. Better safe than sorry. A gravel pad can support a great deal of weight if properly constructed. It is a favorite for sheds on skids, prefab sheds, and even sheds on blocks or deck blocks. 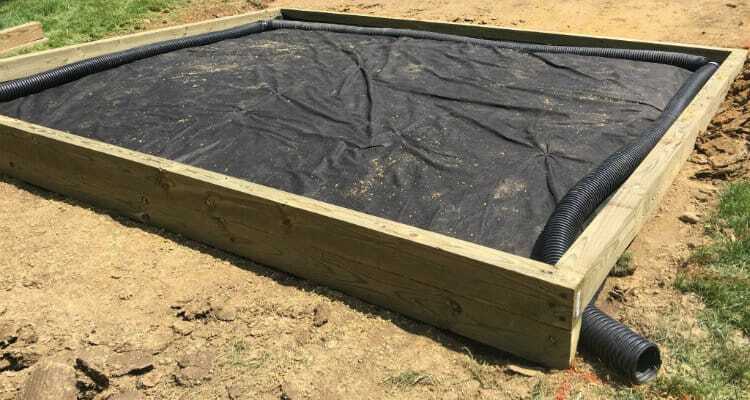 If building on flat ground you don’t need to frame or box it in, but for the more uneven ground it should be boxed with 4×4, 6×6 or larger pressure treated material. The type of soil in your area determines its weight bearing properties. A dense gravel or dense sand and gravel soil can support more than 600 kPa or 12531 psf (pound per square foot). A compacted gravel base will provide similar support and stability if properly constructed and drained. A gravel pad unboxed, boxed, or with retaining walls is an excellent DIY project. However, if you need to excavate a lot of material and construct large retaining walls, you may want to speak to a professional. Saving a buck or two on something you feel you can do and have the time to do is great. Heavy equipment rental and retaining wall construction may make the professional a better deal though and often includes a warranty. Most people refer to crushed stone and gravel as if they were the same; they are not. Gravel is a naturally eroded material and crushed stone is just that, mechanically crushed stone or rock. They even have different uses. Gravel is rounded smooth stones of different sizes and colors found in riverbeds or ancient glacial deposits. It is often comprised of different types of rock material and comes in sizes ranging from ¼” to 2” and up to 20 or more inches. It is used for decorative garden beds, walkways, landscaping, and drainage projects. The smooth rounded stones permit moisture to pass through the gaps between the stones; which also make it difficult to compact. Crushed stone is often of the same rock material and of the same color. The edges are angular from the crushing process. It ranges in size from stone dust to 4 inches. Larger chunks are usually referred to as rock fill. Crushed stone is primarily used for the construction of roads, driveways, foundations, rail beds and in cement and concrete products. The broken surfaces lock together better when tamped, rolled or vibrated to make a more stable base. When planning to build a shed and choosing a foundation, site evaluation is an important step. You need to determine where to put your shed and what ground preparation is necessary. Check with the local building department to see what type of base they require. They may require a frost protected foundation for larger sheds. If they don’t specify a concrete pad or concrete pier foundation, you can use a gravel pad. Call 811 to make sure you’re clear of utility lines too. When choosing a suitable site for your gravel shed foundation consider the slope, drainage requirements, solar gain, and how firm the ground is. You also need to have enough space for the foundation and to be able to build or place your shed. Trees, roots and rocks should be considered when planning and picking a site. The flatter the ground the less prep work required for building a gravel pad. The more uneven or sloped the ground, the more work needed to level a space for the pad. The greater the slope, the bigger the retaining wall to build. Ground with a slight slope away from your chosen site is better for drainage. Retaining walls often need proper drainage. The sloped ground above your foundation will require drainage to move moisture away from your foundation and shed. Solar gain helps to keep sheds dry and prevent rot. Light makes it easier to see inside your shed. The more open the site, the more wind to cool your shed and sun to warm it. The firmer the ground, the more weight it will support. Wet ground requires more drainage and a gravel foundation may sink. The more rocks and roots in the soil the harder it will be to level the ground. The more planning you do, the easier it will be to build a sturdy, stable foundation. A correctly made foundation will protect your shed and its contents, and any warranty your shed may have. The best material to use for a gravel pad is ¾” crushed stone mixed with finer crushed material and dust. It compacts well and makes a permeable solid stable base with the finer material filling in any airspace. It is often known as crush and run or crusher-run gravel. Different gravel companies use different numbers or grades to identify gravel size and composition. One company may call it 21-A while another refers to the same product as #411. Check the company’s website or call and ask. An alternative method is to use layers of different sized crushed stone or gravel. This method is ideal for filling deeper excavations or retaining wall areas. Spread a layer of fist or baseball sized stone followed by a layer slightly smaller than a ping-pong ball. Tamp each layer as you add it. Finish off with a layer of ¾” mixed with stone dust (crush and run). Compact it down to fill any airspace and provide a well-drained solid base. Don’t use crushed stone that has been cleaned or washed and sorted or graded so it has no fine materials, it won’t pack well. It will shift and move around as you try to compact it. The larger the stone material, the more likely it will sink too. River or glacial gravel that has a smooth rounded surface won’t compact as well either. It’s like having a bowl of marble. The rounded edges are good for drainage, but they move around if you try to compact them. Stay away from pea gravel for the same reason; it’s not compatible. The key material for building a gravel shed foundation is crushed stone. Determine the size of your shed and add 2 or 3 feet to the length and the width for the size of gravel pad. To calculate how much crushed stone, you need multiply the length by the width. This is the area of your pad in square feet. Convert the depth of gravel required to feet and multiply it by the square footage. Divide the whole by 27, the number of cubic feet in a cubic yard to get the amount of gravel needed. 82.5 divided by 27 = 3.06 cubic yards of crushed stone. A fast way to calculate is 1 cubic yard for every 100 sq ft with a depth of 2.5” – 3”. You’ll want to order extra gravel since it will compact down. I’d recommend 4 cubic yards for a 15’x11’ gravel shed foundation. It’s easy to find someplace to put extra gravel, but a pain to be short. Order the gravel you need and schedule delivery. Weed barrier comes in rolls or folded sheets. It is water permeable to allow water through but stops the weeds from coming up through. You’ll need enough to cover the full area covered by the gravel pad. A gravel shed foundation can be built within a pressure treated wood frame or box or without a box on flat ground. The boxed pad, or retaining wall pad, can be used on the flat ground or to create a level base on uneven terrain. If the soil is really sloped, bigger retaining walls may be used to create a level boxed base. A gravel pad in a pressure treated 4”x4” or 6”x6” frame or box is also known as a retaining wall pad or a timber frame pad. The retaining wall can hold the ground away from the pad, or keep the gravel foundation in place if the ground is sloped underneath it. Remove all vegetation and rocks from the building area. The area should be larger than the gravel foundation. Add 2 to 3 feet to the length and width of your shed measurements and for the pad perimeter. Stake the 4 corners and run the Masons string to show the boundary. Use a string-level or line-level to check how level the building site is. The diagonal distance between corner stakes should be equal for the corners to be square. Remove any grass from within the pad perimeter. Find the lowest corner of your site using the string level. Start at the lowest corner and dig down 4”-6” deep and dig out a level trench around the perimeter for the pressure treated frame or box. Use the 4-foot level and 2×4 to make sure the border trench is level. The perimeter is 2 to 3 feet wider and longer than your shed. Place the first layer of 4×4 or 6×6 pressure treated timbers. Notch and overlap the corners. Add more layers as necessary. Once the frame or box is flush or above ground level at the highest corner, drill through the timbers at the corners and hammer in a spike or ½” rebar piece. Hammer in spikes or rebar into all sides every 2 or 3 feet. Pre-drill the holes with a smaller diameter than the spikes you’re using, or the same diameter if using rebar. Once the box or frame is built, remove the topsoil so it is 4 to 6 inches below the top of the lumber. The soil doesn’t need to be level, just 4 to 6 inches below the top of the box. The crushed stone will make the foundation pad level. Check to make sure the frame is square and level, and that spikes and/or rebar are hammered in. Ensure the soil is at least 4 inches below the top of the box. Remove all loose soil and organic material so it won’t cause settling later. If building into a slope, it is best to consider drainage inside your timber frame or crib. Perforated plastic drainage pipe in a sleeve placed inside the trench will help move water out of the box or crib and away from the wooden retaining wall. Installing a weed barrier will help prevent the growth of weeds. It should be installed within 6 inches of the surface to be effective. Lay the fabric out on the compacted stone or soil and then cover with the last layer of gravel, and compact into place. Fill the deeper sections of timbers first. Use a shovel or wheelbarrow to place it. Tamp or compact the gravel down every time you add 4 inches of gravel depth. Use the tamper or the compactor, depending on space. The more you compact the gravel is as you fill it, the less chance of settling later. Compact the gravel using the plate compactor. Use the steel rake to move gravel into low spots from high spots and compact again. Once the gravel is even with the pressure treated frame, use a straight 2×4 across the narrow dimension to check for high or low spots in the gravel. Remove the highs and fill the lows, and compact again. You can use the 2×4 to screed the gravel until it is roughly level. Use the 2×4 with the 4-foot level to check for level lengthwise too. If the gravel is dry, lightly wet it with a hose. It compacts harder when slightly damp. Add or remove gravel as necessary, and compact again. You should have a flat, level, hard surface when done. A gravel shed foundation sitting on the flat ground or sunk into the ground is also known as a Free Form. It needs to sit on level or near level ground. Clear the building area. Remove all trees, stumps, rocks, and shrubs. Clear a larger area to give space to move and work around the pad and shed. Measure the shed perimeter; add the extra 2 to 3 feet for the extra distance around. Hammer the stakes in at the 4 corners. Use the Masons string to outline the perimeter with the stakes. Square up the corners using diagonal measurements; the diagonal distances should be equal. Remove the grass and topsoil from within the shed pad perimeter. Dig down a minimum of 4 inches; 6 inches deep is better. Level the soil surface using a metal rake. Use a 4-foot level and straight 2×4 to check level. Compact the soil base using the Tamper or plate compactor. Roll out the weed barrier. Pour in the gravel. Shovel and rake level to 4 inches thick; the gravel base must be compacted at every 4 inches of thickness. Compact the gravel with the plate compactor. Add the remaining gravel, rake level, and compact again. Use the 4-foot level and 2×4 to check level. Rake gravel into shallows and compact flat. Grade the sides of the gravel pad and the ground so moisture flows away from the pad. The cost of the pressure treated 4×4 or 6×6 timbers for the frame will depend on the perimeter of the gravel foundation, and the elevation due to the slope. A 12 foot 4×4 is about $20, a 12 foot 6×6 around $50, and a 16 foot 6×6 is between $60 and $70. Check with your local lumber store for the best prices. 8” spikes cost about 45 cents each, 10” spikes are between 60 and 70 cents and 12” spikes around 80 cents. Shop around depending on how many you need. ½” rebar is sold by the foot in some stores and by the length in others. The longer the length the less the cost per foot, a 10-foot length is about $6. Buy longer pieces and cut with hack-saw or cut-off grinder. The cost of the ¾” crushed stone with gravel dust blend (21A) depends on your location. It ranges from $30 to $50 a ton. The delivery may be included depending on how far you live from the plant or quarry, or a flat rate based on distance. A cubic yard weighs approximately a ton. Add in about $20.00 for garden cloth. The cost to build a free flow gravel pad with weed barrier would be approximately $180.00 before taxes. Many localities and insurance companies now require all sheds or outbuildings to be anchored, especially if in high wind zone areas. You’ve put time, sweat and money into building a stable foundation for your shed; a little bit more to protect your shed won’t hurt. The size of your shed will determine how many anchors you need, and what type of anchor system is best. You can use auger style anchors to secure your shed to the pad. They can be used with cables or straps, or with anchor plates attached to your shed. More permanent concrete pilings can be installed and used to anchor your shed too. Your local building department will let you know what the minimum requirements are. The flatter the terrain, the less work leveling the ground. Building a gravel pad is a heavy physical activity. The bigger the pad, the more labor-intensive the job. Better to have help or pay others than for this to be your last project. Use ¾” crushed stone mixed with finer crushed material and dust (21-A), NOT gravel. Remove the topsoil, it is compressible and will shift under the weight of the gravel and shed, causing you pad to settle and shed to tilt. Make sure to build your pad level, especially if building on a slope. Ensure the timber frame goes all the way around and is level. Use longer rebar or spikes to anchor the timbers into the ground too. Don’t have the delivery truck just dump the gravel in the timber frame and spread it from there if the finished pad will be more than 4 inches thick. It won’t make a stable level pad. If the gravel pad will be more than 4 inches thick, then spread it in 4-inch layers and tamp or plate compact each layer. Don’t skimp on the gravel, 6 inches thick is better than 4 inches. If you plan to top the gravel pad with concrete, you need to remove 8 inches of soil to have 4 inches of gravel under the 4 inches of concrete. If you plan to lay pavers on top of the gravel foundation, remember to include the 2 inches for the pavers and 2 inches for the sand between the pavers and the gravel. The sand makes it easier to level the pavers, supports them so they don’t crack, and helps hold them in place. Check with your local building department for their requirements and remember to check with the utility people too. A gravel shed foundation may be an easy foundation to build, but it’s a lot of grunt work too. Whether a free form or timber-framed pad, it must be compacted and as close to level as possible. If it’s not level, it will fail and damage your shed. Hopefully, you now know how to build a gravel shed foundation using crushed stone and not gravel. Your comments are appreciated. If you know someone who is thinking about building a shed foundation, share with them if you liked it. You don’t have to hire the professionals; you can build it yourself. If building on a slight slope but a larger foundation (12 x 16′ shed), do you have to have the same depth of 4×4’s all the way around? The drop off from one end to the other could be 12″. You need to keep trench for the frame 4”-6” deep at the lowest corner. It may be deeper at the highest corner.